Compact UV dryer as table top unit with variable conveyor belt speed for a fast curing and hardening of UV sensitive inks, UV varnishes and adhesives of small printing sizes for tests or production of flat and moulded materials. 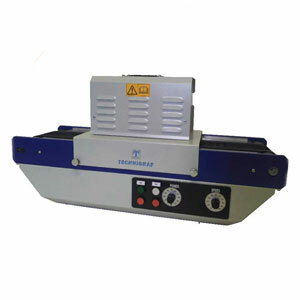 Standard version Ready to use compact table unit with 2 UV tubes, Hg. Massive, elliptical aluminium half reflectors. Easy replaceable facetted aluminium mirrors. Very fast change of tubes at reflector.